This is another one my exercises that I give to my athletes/patients in the controlled articular rotations (CARs) category. The training method and acronym is popularized by Dr Andreo Spina. It was taught to me at a Functional Range Conditioning course in Winnipeg. I call them “circles” to my patients because it’s easier for them to understand. What I like about CARs is that they are easy, yet challenging, and expose to my athletes areas of mobility that they may be lacking in. The intent of this exercise is to challenge the hip at its end ranges. The end range of motion is commonly the weakest area. This helps us to strengthen this region and also helps to keep our hips joint healthy through all ranges of motion. Unlike stretching, which passively improves the range of motion, this movement makes the muscles work at the end range of motion. Hip Circles can be performed on their own or, ideally, at the end of a stretching session. Start in a quadruped position, on all fours, lift the knee up to your chest limiting the amount of rounding of the lower back. Keep the knee up and move the knee to the outside as far as possible, keeping the pelvis horizontal. keep the leg up and bring it back behind you. Try not to over arch the back at this point in the exercise. 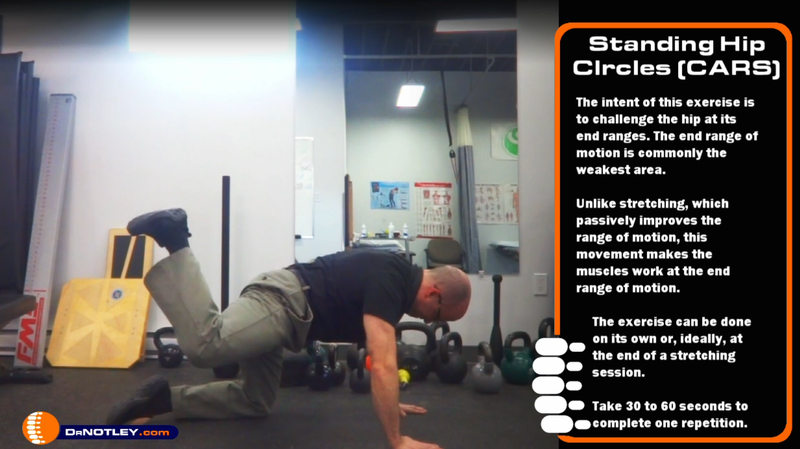 This exercise is part of a type of exercise called controlled articular rotations (CARs). The training method and acronym is popularized by Dr Andreo Spina. It was taught to me at a Functional Range Conditioning course in Winnipeg. I call them “circles” to my patients because it’s easier for them to understand. What I like about CARs is that they are easy, yet challenging, and my athletes/patients like to do them. Standing hip CARs can be performed on their own or, ideally, at the end of a stretching session. 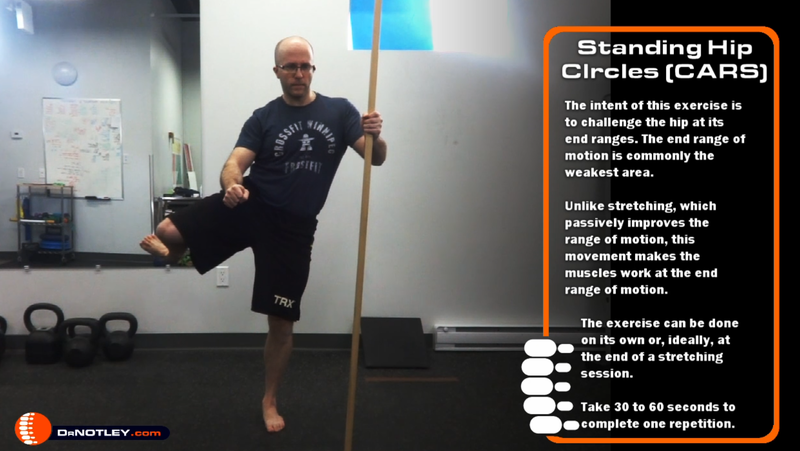 This exercise can be performed with a pole, stick, or just balancing on one leg. Using a pole helps you if you have balance issues. If you can stand on one leg but with movement you struggle a bit, the stick will add a little bit of support to help you perform the exercise. As you get better, you can work at balancing on one leg while performing the exercise. Lift the knee up as high as you can without rounding the lower back. Keep the knee up and move the knee to the outside.